It was amazingly quiet and comfy in the hut last night. I hardly woke at all, and it was really warm. It started raining around 3am, and only stopped for a brief but around 6am. We knew really heavy rain was forecasted for tonight, and it said “periods of rain” during the day. 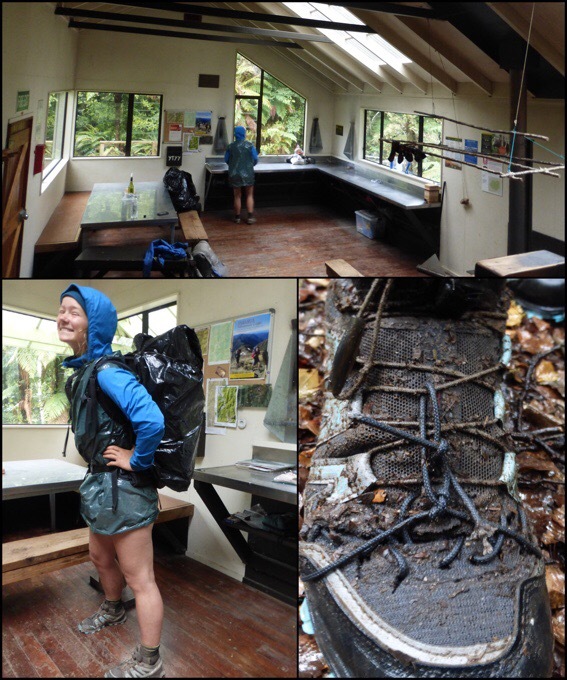 Since we pretty much hiked a day and a half yesterday to make it over Mt Crawford, the plan was to hike a half day today in “periods of rain” to end at the Parawai Lodge (Hut) and be protected from the heavy rain overnight. Since it was only 6mi/10km of hiking, we got a relaxed start after sleeping in. It was a great spot, and it was tough to get motivated to go out in the rain. The hut had some great windows to just watch the rain fall. Since it was raining, and we had extra food, I was happy to have a double breakfast, and we both cooked a Ramen before we left. Becky was able to use some cord from another person to lace her shoes together. She also grabbed trash bags that were at the hut for added protection. No rain jacket will keep anyone dry on a day like today, so the trash bag is great for insulation. Again, I love my umbrella, and it worked really well to keep my core less wet. I feel like it also keeps a bubble of warmth around my head and shoulders. We headed out at 10:20am, just after everyone else. Yoko, Bill, and Emily were just ahead, and another couple (Carol & Ray) were an hour or so ahead of that. They are locals that have done this track before, and mentioned an alternate route that was also mentioned in the trail notes. It would have saved some time, and given the weather, I considered it, but none of us were able to find it. 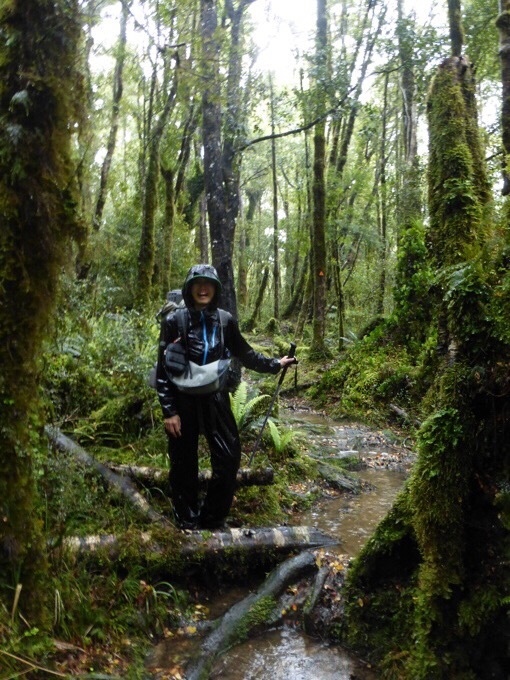 Carol and Ray also offered to host us tomorrow night in town, so it will be interesting to hear how their day went compared to ours, which turned out to have some seriously flooded trail and streams. The day started off somewhat fun with us figuring we only had to do a half day in the rain. The rain came down steadily to hard all day, but it was just warm enough (60F/15C) to make it okay. Somehow, the forecasted heavy rain must have pushed up to during the day, because it was relentless. 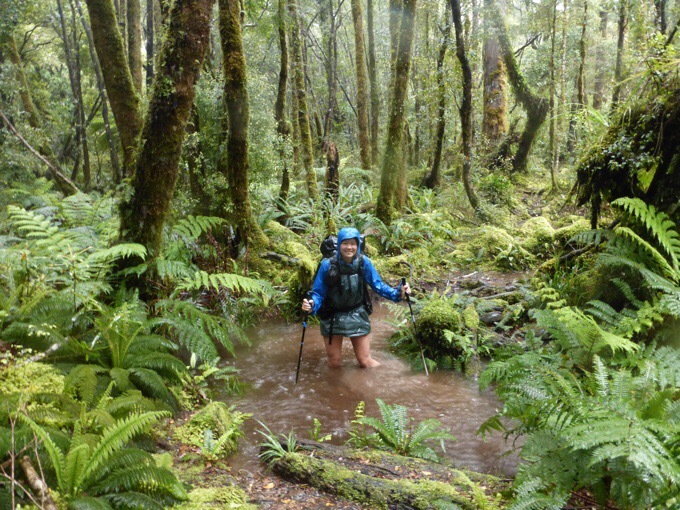 It was like walking in a stream for most of the day. About an hour or so into the hike, we passed Yoko and checked in with her to make sure she was ok. She doesn’t speak much English, is quite small, and we aren’t sure how experienced she is as far as being alone in these conditions. She’s made it this far, but does skip sections she doesn’t want to do, so we’ve overlapped with her two other times in towns. She gave us the go ahead, and we knew it was a short day to the lodge and told her we’d see her there. Thirty minutes later, we came to a flooded side stream that we had to cross that was just barely crossable for us. As soon as we crossed it, we looked ahead to see another one just as swift and twice the length. We immediately thought of Yoko (couldn’t be even 100lbs/45kg) and that there was no way she’d be able to get across either of those by herself. We waited a good 10mins for her, and she didn’t come, so we crossed back and walked back a bit to find her. She was walking with just one pole and was going slow. We’d also been going slow all day given our day yesterday and knowing we had plenty of time today to be careful. We got across those two crossings with Yoko, but for both of them I linked arms with Yoko to keep her stable, and got a solid base to hold her up as she crossed around me. We’d hoped that was the end of the crossings, and we hiked on telling Yoko we’d wait if another one was ahead. Well, a very intimidating one was right around the corner. I don’t even want to describe all we did for Becky and myself to barely make it across, but it was frightening enough that there was no way Yoko should try it. The problem was that we were now on the opposite side, and there was no way either of us were going back through that crossing. Yoko could not go forward or back on her own, but she was standing at a very good campsite. 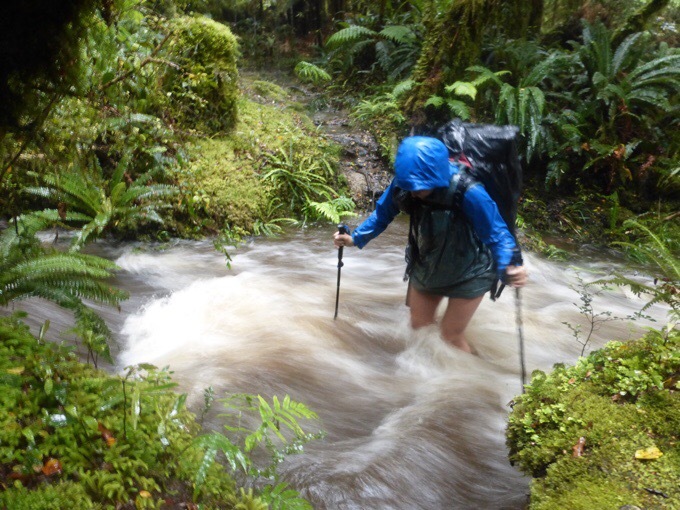 With limited communication, we found out that she had three days of food to be able to camp there until the stream went down, and she fully understood that she needed to sit it out and wait for the rain to stop and the stream to go down. She was setting up her tent as we left. Unfortunately, she didn’t have a locator beacon. There really was nothing else we could do, and given the forecast we all knew, it should go down in the next three days, and then she could get to the hut where there would likely be people or the ranger not far from the hut. There was also another couple back at the hut from this morning that would be hiking out the next couple of days. We knew exactly where she was given the junction we were at, and our plan is to also tell the ranger when we pass the station tomorrow morning. It was a tough decision, but we weren’t sure what else we could safely do. Why the heck don’t people (especially traveling solo) carry personal locator beacons!? The same sort of situation has come up with Flo (who we last saw yesterday) and hoping that he too is ok, but he has no way to contact anyone if he isn’t. 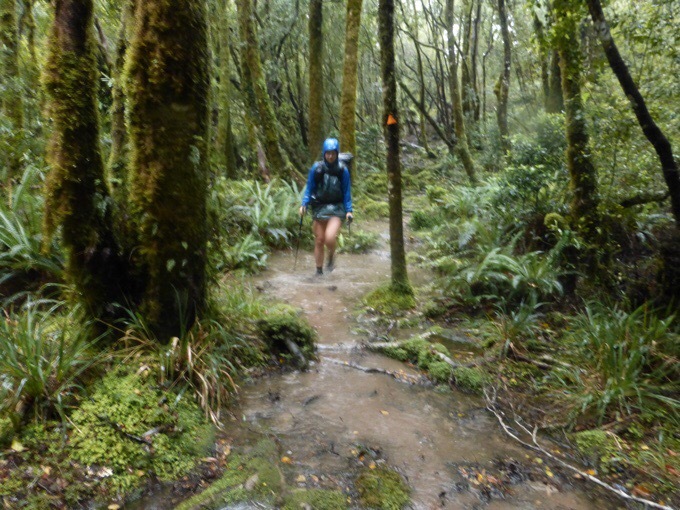 We hiked on through hours of over saturated trail and countless more crossings. It got so wet that I put my phone and camera away for the last couple hours. Again, I don’t want to detail some of these crossings, but they were frightening. 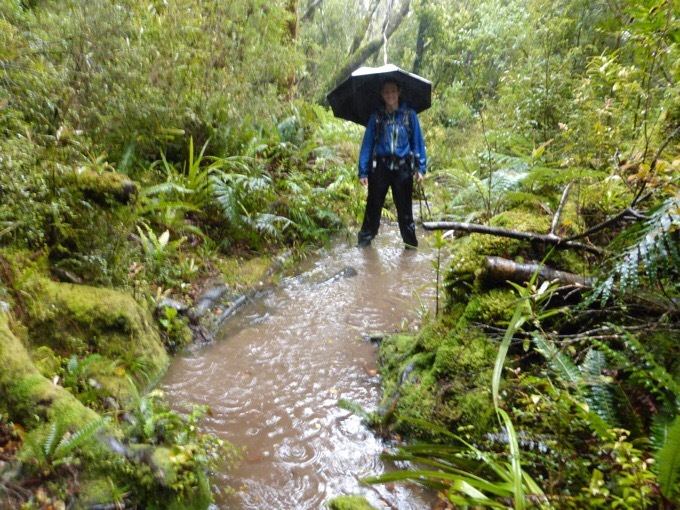 What was frustrating is that nothing in our trail notes mention anything about these streams and how quickly they swell. I got a heads up from a local blog follower, but kicked myself for not going first thing in the morning because the rain had only been falling for a handful of hours, and I just didn’t think they’d rise so quickly. I for sure knew to be through it today, but I was thinking the swelling wouldn’t occur until the real downpour overnight tonight and that today would be fine. Nope, apparently not. Why create drainages when you have perfectly good trail to double as a drainage!? 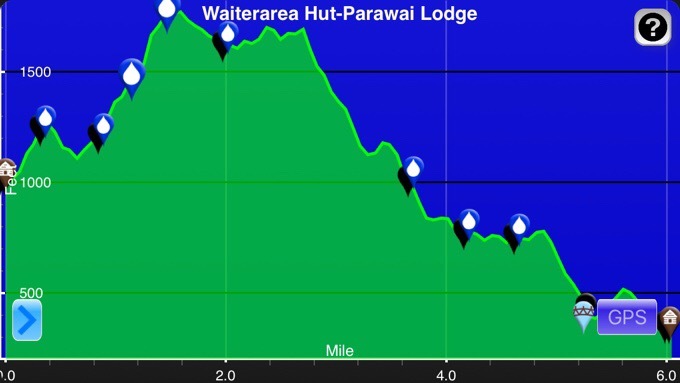 We didn’t get to the Parawai Lodge, which is a hut, until 4:15pm, so it took us 6hrs to go 6mi/10km. Not the relaxed half day we’d hoped for. It’s always something out here! We did hike very slowly to be careful, and we took time on the more raging crossings to find the least harrowing option. We both are quite happy that’s over. It really did border on us also just setting up a tent to wait it out, but other than where Yoko had tented, there really was nothing with how flooded it was. Plus, we knew there were three couples just ahead of us (on TA and two local) that made it through, so we knew it was doable. We just didn’t expect it at all since the rain hadn’t been falling for long, and none of the local couples mentioned anything about it as they headed out this morning, not long before us, to go the same way. 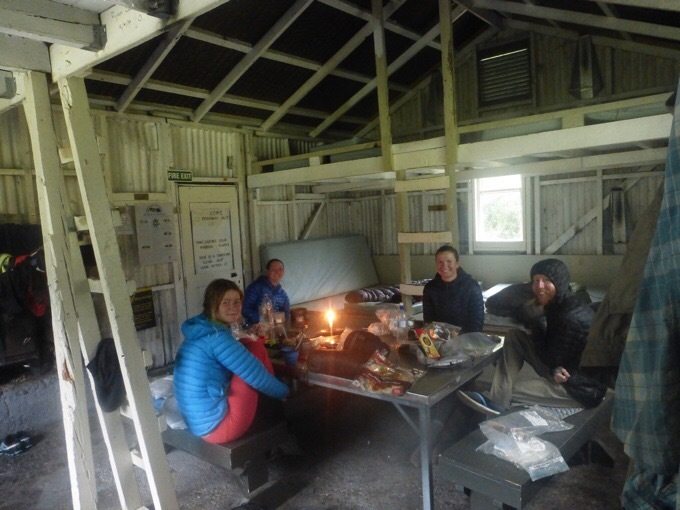 When we got to the hut, Bill and Emily were there and said they had just arrived 30mins ahead of us. We got to bond over our crossing experiences. They said they were with one of the local couples a bit this morning, and they said that yesterday they didn’t even get their feet wet walking up to the hut that same path. That’s how quick and extreme the change was. Had we known, we could have gotten a much earlier start this morning. I really want to hear how Carol and Ray did as well when they host us tomorrow night. Bill and Emily heard from a pair they met today that the weather forecast has changed a bit, and the rain should let up a bit tomorrow. Two people came into the hut tonight as we were laying down, and they also heard it would be less rain tomorrow, but still rain. I got a weather forecast using my inReach satellite device and it also shows a much lower chance for rain tomorrow before it kicks in a again the next day. 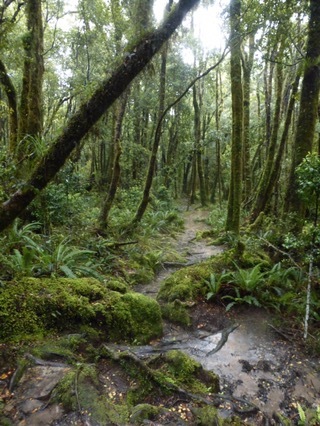 We have an 8mi/14km track to do, and then a road walk into Waikanae. We had hoped there could be a road parallel to the track, but there isn’t, so we just hope this one doesn’t have streams like the one today, because we aren’t doing that again! The track follows a ridge that goes up to a peak, so there is a pro there, but the high winds are a con. 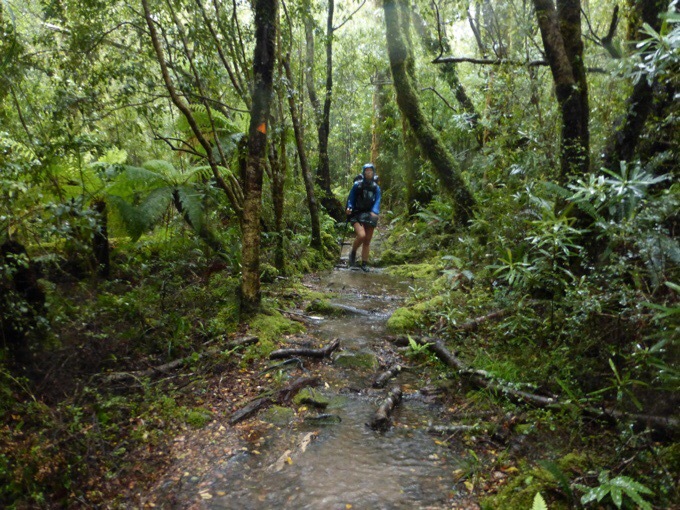 There is only one stream crossing right at the end of the track before the road, but there are also camping options if needed if we can’t cross it. We will be so happy to get that done tomorrow and are just glad we made it down before all this moved in. Side note, we’ve overlapped with Bill and Emily a few times briefly, but the last few days have been the most. They also have a blog that is more detailed than most, so some of you may be interested. They are from Colorado, and this is their first thru-hike. They too are walking the whole way, but are on the fence about the TA and how they want to spend the rest of their vacation time. Bill writes the blog that is called www.risorum.com. He says it’s a Latin word, which is classic because they are both aerospace engineers and obviously more thinkers than Becky and I combined, ha! Just having Bill explain to me what risorum means was funny as it was well over my head. He said it’s the “genetive plural of laughing or smiling or happiness.” Whatever it is, I like it, and I recommend checking out their experience as a couple on their first thru-hike. Bill says it’s a bit behind, and sometimes photos come much later than the post, but he is working to get the days up there. Alright, let’s all hope for less rain tomorrow! Oy vey. So glad you guys are doing all you can to stay safe out there and to look out for other hikers. 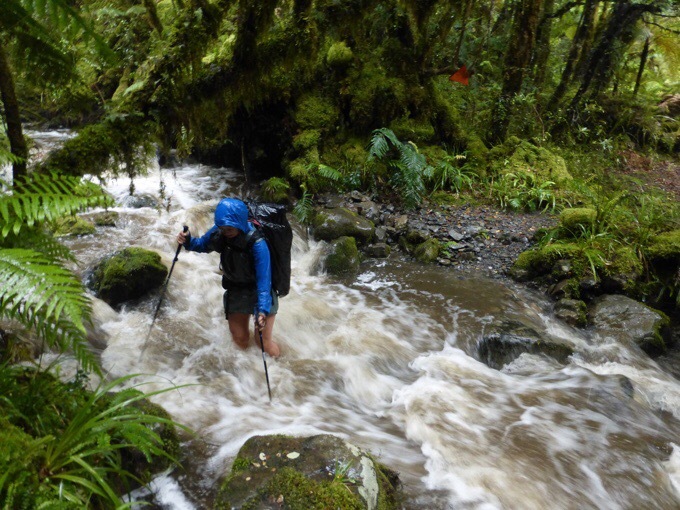 You are encountering very tough weather … not unusual for New Zealand, but makes difficult terrain even harder! 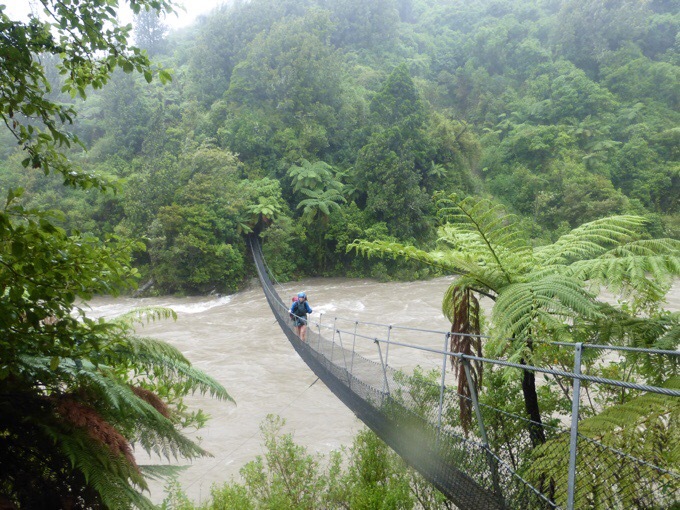 As you stated from all your research, the rivers in NZ are just crazy how fast they rise. It will become more of an issue on the South Island, but sounds like you are well equipped to deal with making responsible and smart decisions. Hopefully other hikers out there realize these dangers and follow suit! Yeah, well aware of it for the south as well. Yep, that’s what we heard. Just with this one, we weren’t as informed as we could have been about the possibility of swollen streams so soon in this area. Even the locals didn’t expect it, and as far as we knew, multiple days of rain were ahead, so thus the motivation to get through it. Yep, my gut is to do that and I for sure got lazy on this day given the day before. I should have pushed to leave earlier, but everything is 20/20 in hindsight. Happy New Year! What a crazy way to start 2017! Frightening. How about you not do that again? Should be a great year for you. Be safe! Yeah, definitely not needing to do that again! Thumbs up for going back and looking out for Yoko. Far better to be crossing as a team than alone. And wise to wait it out if crossing becomes too dangerous. Cross fingers for a nice spell of settled dry weather ahead. Luckily it came, so she probably did get out the following day. Good to know you are safe and endured the elements thrown at you ! Good on you for helping out Yoko …. I hope she manages to get through without mishap . I hope the rest of the way is uneventful . Thanks for sharing-I’m sure you really want to rest your weary bones and not even think of blogging . Exactly! There are some zeros coming in Wellington we both really need! Glad the snake worries aren’t a factor here for sure! Glad that you two teamed up with another when they really needed. And glad you took your time to be safe. Hope that the weather lets up so your days will be more light and fun. You are creating good beta for those that will walk after you. Good on ya as they say! Hey Erin and Becky, Phil and Ella here (the other couple from Waitewaewae Hut/gave Becky the lace for her shoes). We tramped out the following day in the sunshine and caught up with another tramper and Yoko at her camping spot. Yoko was fine, but tired and wet. Phil carried her pack till she warmed up, and we tramped with her for about 3 hours and got her out to where the tramp gets onto the easier track (bottom of the steep section with the railway tracks). Yoko wanted to rest there and was happy to go the rest of the way to the Lodge of her own. Oh that’s so awesome! Thanks so much for finding my blog and telling me. How did you know how to find me?? I was reading through the TA website today as Phil and I hadn’t heard about it previously, and there’s a section on there with people’s blogs. I remember you talking about having a blog and we saw your names in the hut log book so I found you through there. And read your blog posts from the last few day and your concerns about Yoko. Hope the weather is better for you today than where we are (at home). Oh, and did you say another tramped was camped with her? Was it Flo?? Not camped with her. The tramper overtook us not farfrom the hut and they were waiting with Yoko to help her over the stream crossing from camp. They came from Anderson Memorial Hut, and I think they were a local. Maybe Flo decided to sit out the rain for an extra night. We didn’t see notice the note you left for Yoko, if we had we’d have given her a ride out. Also checked the Lodge to make sure you guys made it out okay. Awesome, thanks! I did see Flo made it out with another hiker yesterday it seems. The rushing water makes for a great image, but so treacherous! So happy you helped Yoko get to a safer place and that she had food and stayed put and just lovely to get this update from Ella. I just listened to the podcast you posted with Zuul and others about community on the trail and you are describing this example of that in a far less travelled location than the PCT or the AT. Glad you guys are safe. Hope it stays that way.